Ann Marie Fleming’s animated film Window Horses: The Poetic Persian Epiphany of Rosie Ming is incredibly colourful. The film’s French title is La vie en Rosie : L’épopée persane de Rosie Ming – a different cultural reference, while the alliteration remains. Rosie loves Paris even though she has never been there. After self publishing a slender book of her poems (My Eye Full, Poems by a Person Who Has Never Been to France) Rosie is surprised to receive an invitation to a poetry festival in Iran. Rosie Ming is drawn as a stick figure in the film Window Horses: The Poetic Persian Epiphany of Rosie Ming. Rosie loves Paris, but there’s a map of Iran under her Paris poster. When Rosie tells the customs officer that she is attending a poetry festival in Shiraz, he says that he is a poet, too. Everyone in Iran is a poet! Even though she is quite young and has only written one book, Rosie is treated with warmth and respect by everyone at the festival, apart from snarky German guest Dietmar, who usually has his nose buried in his phone. 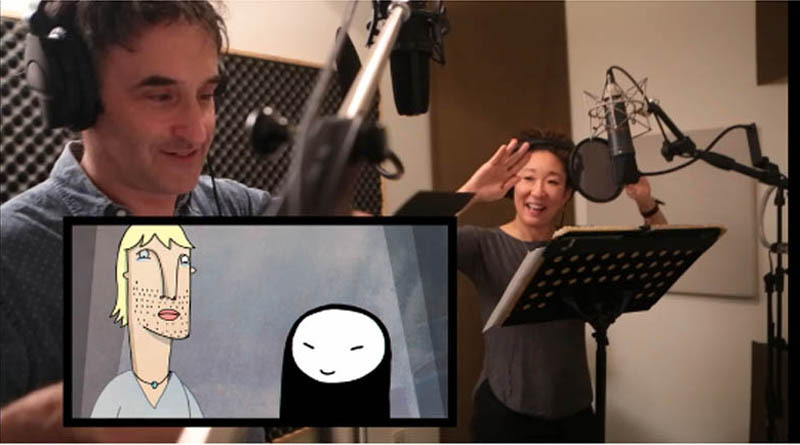 Don McKellar and Sandra Oh enjoy themselves recording the voices of Dietmar and Rosie, for the film Window Horses: The Poetic Persian Epiphany of Rosie Ming. Rosie knows about Rimbaud, Baudelaire and other French poets; in Shiraz her hosts introduce her to the verses of Iranian poets Rumi, Hafiz (also spelled Hafez) and Saadi. The last two were both sons of Shiraz. Window Horses is full of beautiful sequences; here are two. We hear the call to prayer coming from a minaret. The sounds are represented by colourful ribbons that fly through the air. Soon an enraptured Rosie is floating with them. (This sequence was made Kevin Langdale, who is the lead animator and designer of the entire film.) 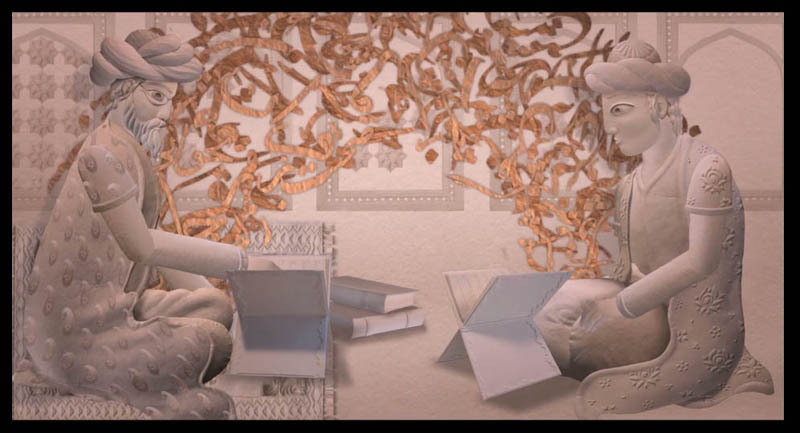 A sequence describing the life of Hafiz is exceptional, with complicated paper cut-outs, whirling calligraphy, etc. Bahram Javaheri, a Vancouver-based Iranian filmmaker, made the cutouts and Michael Mann assembled and animated them using Adobe’s After Effects software. The Iranian poet Hafiz, right, listens to his father recite poetry in a scene from Ann Marie Fleming’s animated film Window Horses: The Poetic Persian Epiphany of Rosie Ming. Bahram Javaheri, a Vancouver-based Iranian filmmaker, made the paper cutouts and Michael Mann assembled and animated them using After Effects software. Rosie does not know much Mandarin beyond “ni hao,” yet she is moved to tears by Di Di’s untranslated poem. Even though she does not know the words, she feels their meaning and the emotions behind them. In a flashback scene, Rosie’s parents meet and bond immediately over their shared love for Rumi. When Rosie’s father recites a Rumi poem in Farsi, Rosie’s mother cries crystal tears. When Rosie’s parents meet, her future mother, Caroline, is reading a book by Rumi. Caroline cries when Rosie’s future father recites a Rumi poem in Farsi. Despite much warmth and happiness in Rosie’s life, and in her visit to Shiraz, there is an undercurrent of melancholy, with gusts to bitterness. Her mother is dead, and her father abandoned her when she was 7 years old. How could he do that? Many people in Shiraz knew her father, and they tell her he was a very good man. At first, Rosie does not want to hear anything about him, but then she, and we, make some surprising discoveries about him. To reveal more would be to spoil things. Window Horses is among the two opening films of Les Sommets du cinéma d’animation, 15th edition, at the Cinémathèque Québécoise. It will be shown Wednesday, Nov. 23, 2016. at 7 p.m. (Oooops, the screening is now sold out.) Window Horses will get a general release in Canada in 2017. Read more about Window Horses on the Cinémathèque’s web site. Previous Post RIDM 2016: Sundance Now has got a deal for you!